Tebet Bina Marga Unit personnel clean up Manggarai Underpass walls on Jl. Sultan Agung RW 12, Manggarai Urban Village, Tebet, South Jakarta.
" We clean up Manggarai Underpass wall by repainting it"
South Jakarta Bina Marga Sub-dept. 's Manggarai Bina Marga Unit Head, Eva Andrian stated, three personnel from Tebet Bina Marga Unit are deployed to clean underpass walls. 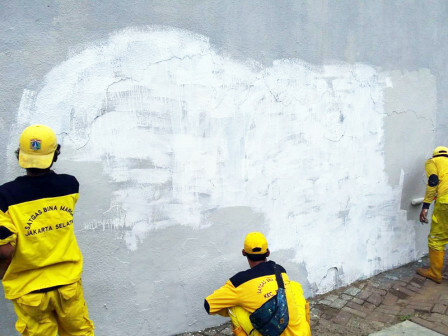 "We clean up Manggarai Underpass wall by repainting it," she stated, Tuesday (11/13). She explained, this vandalism made this wall becomes unsightly. "After it is cleaned, I hope together we can maintain this public facility," she expressed.